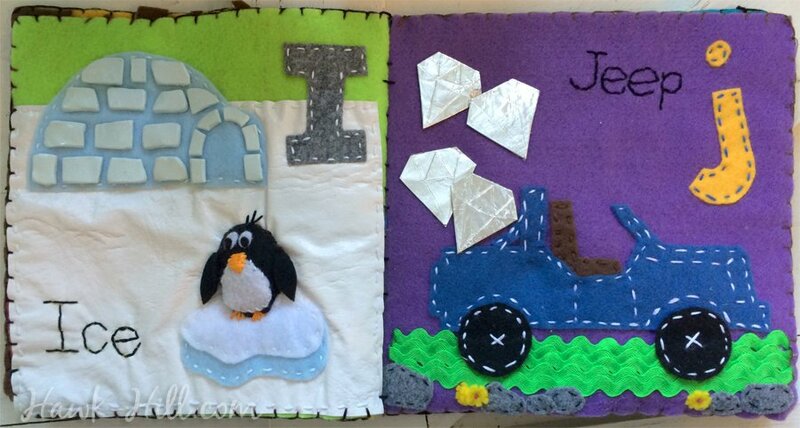 I made my first felt quiet book as I was preparing to return to school for my masters degree in Psychology. I’d recently began reading up on sensory development and sensory stimulation for children. Turns out, I learned, that children’s books that include textures and sounds and interactive elements aren’t just for entertainment. Along with rough-and-tumble play and exploratory play in the great outdoors, books that engage more than one or two senses (typically: visual and, when read aloud, audio) help provide the sensory stimulation critical to developing the parts of the brain that help humans understand and interact with the world around us. That’s what was swimming around in my brain as I started the sketches that became my niece’s first quiet book. When I began planning her book, I knew I wanted to go beyond interactive pockets, zippers, and buttons and extend into tactile stimulation. My elephant would have rough burlap “skin”, the lion would have a thick furry mane, and portions of ice would be slick and cool via the use of vinyl and polymer clay elements. 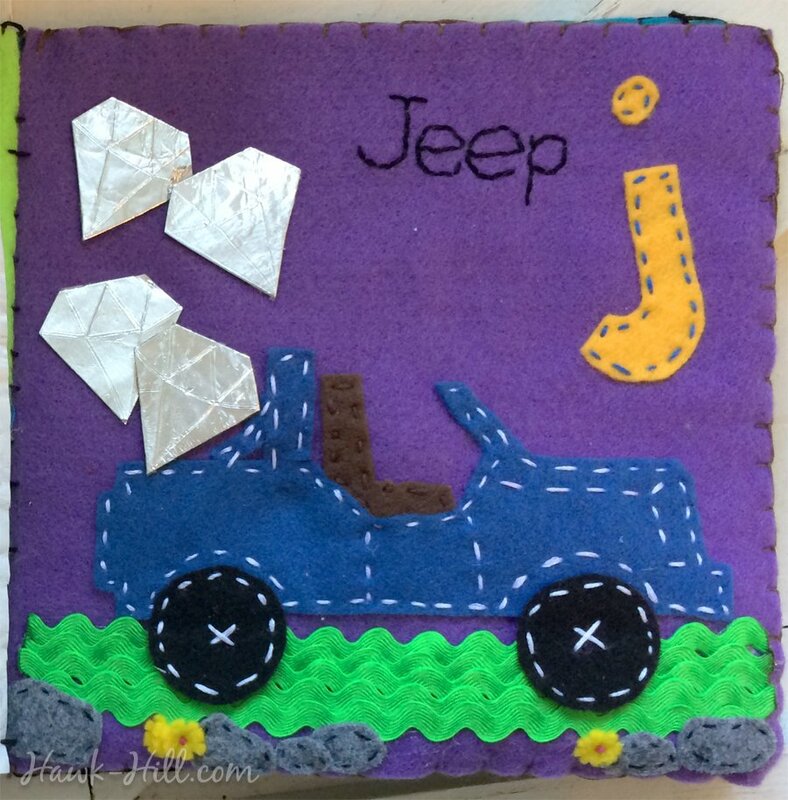 My “J” page, which featured both a “jeep” and “jewels” was an opportunity to add a metallic, hard element to my quiet book’s pages… but how? After some experimentation I settled on the technique described below. 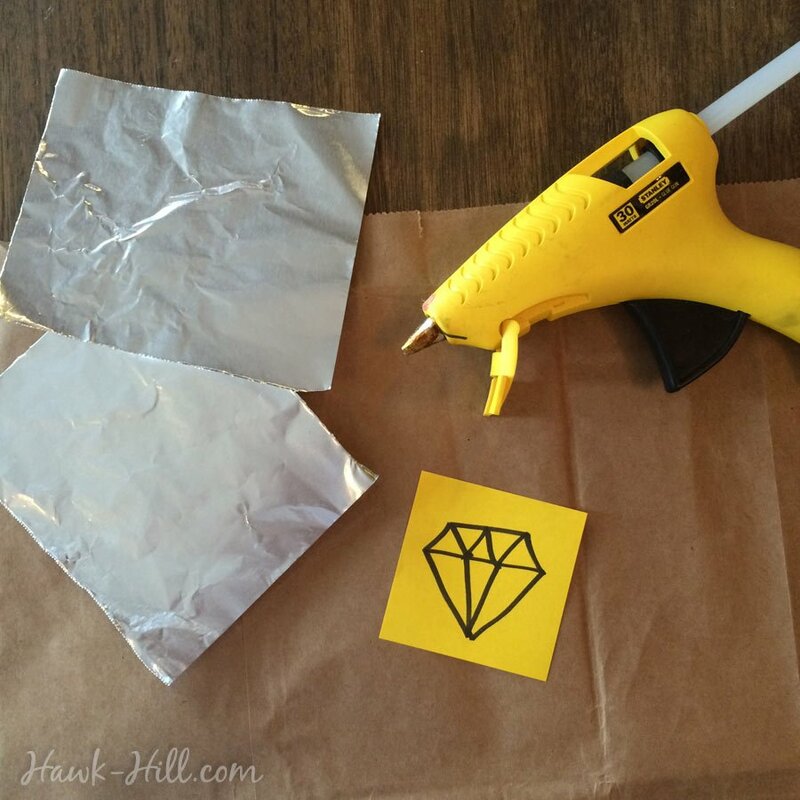 Try it yourself to create child-safe metallic elements in your quiet books (or fun steam-punk style accessories for your next Halloween costume). Just two strong warnings: 1. 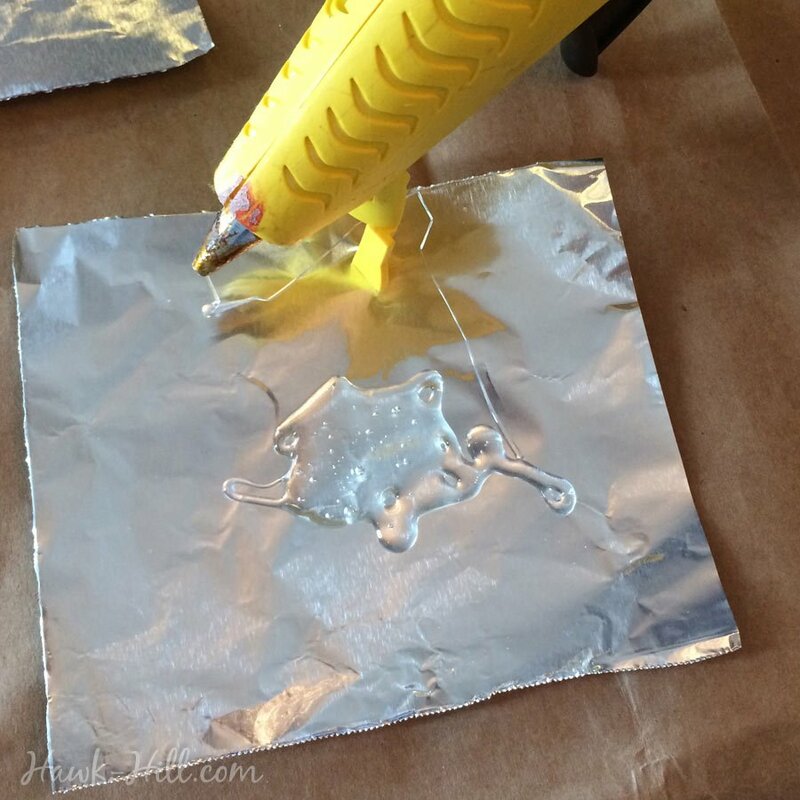 Hot glue is super hot and burns badly, so be careful and be smart by following these instructions closely and/or deviating as your situation requires for safety. 2. Make sure the elements you create are either glued indestructibly securely to the page or are big enough that they cannot be put in a small child’s mouth if they come loose. Ideally, aim for both firmly attached and a non-choking hazard size. ruler or other straight edge. 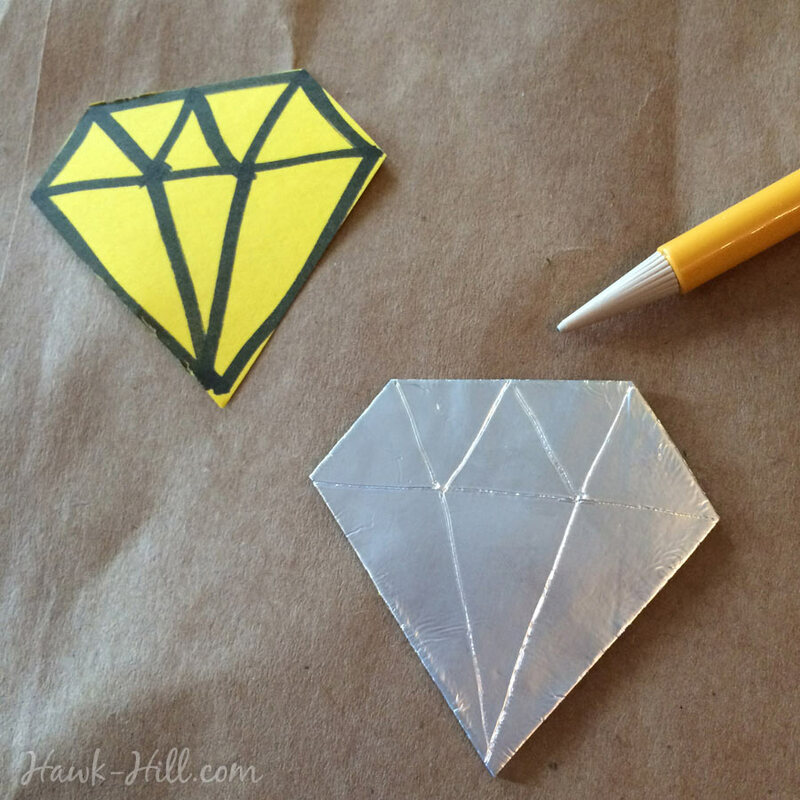 First, sketch your design onto a piece of paper and cut it out. 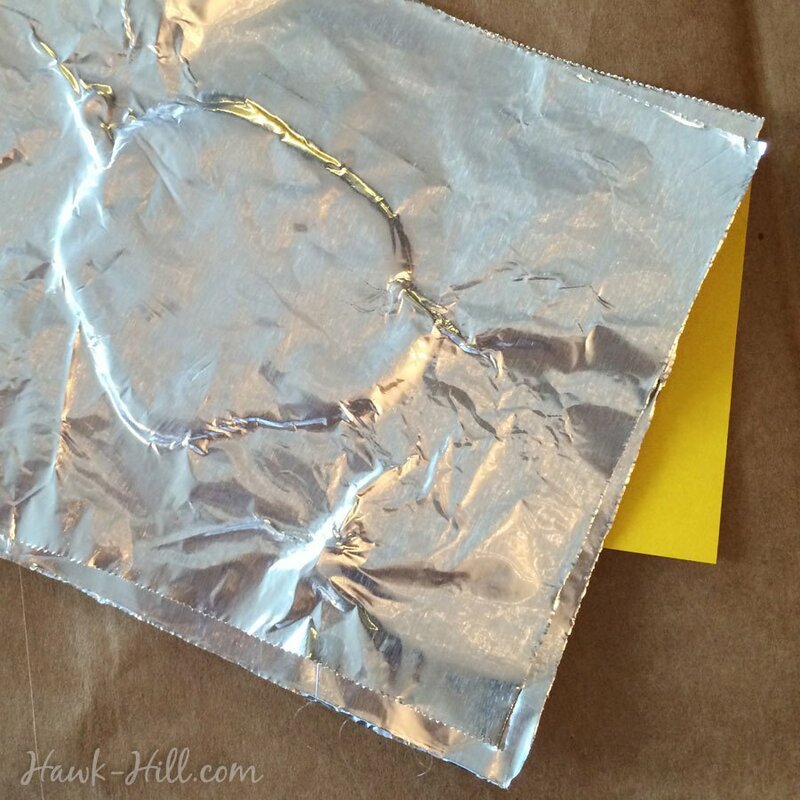 Cut two pieces of aluminum foil 2-3 times larger than the outline of the design you drew. 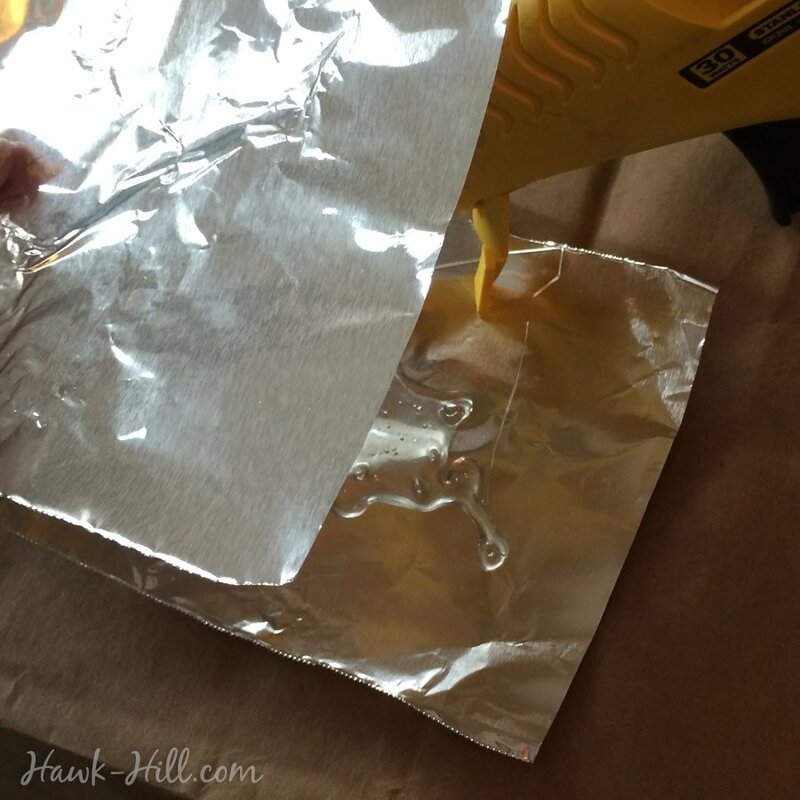 Working quickly, still wearing gloves, place the next sheet of aluminum on top of the glue and use the ruler to press down evenly. 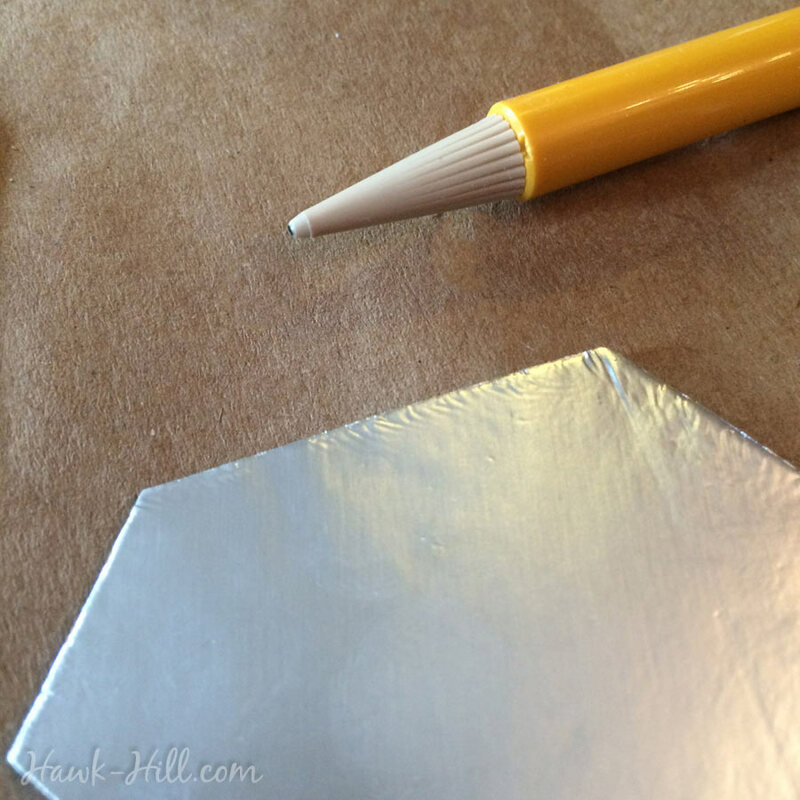 (Alternately, using a heavy book can be helpful to evenly distribute glue) You want to smash the two layers of aluminum together so that the hot glue distributes into an even layer about 1/8th inch thick. Once cooled, you should have a flexible semi-rigid piece of plasticy material with a durable metallic finish. 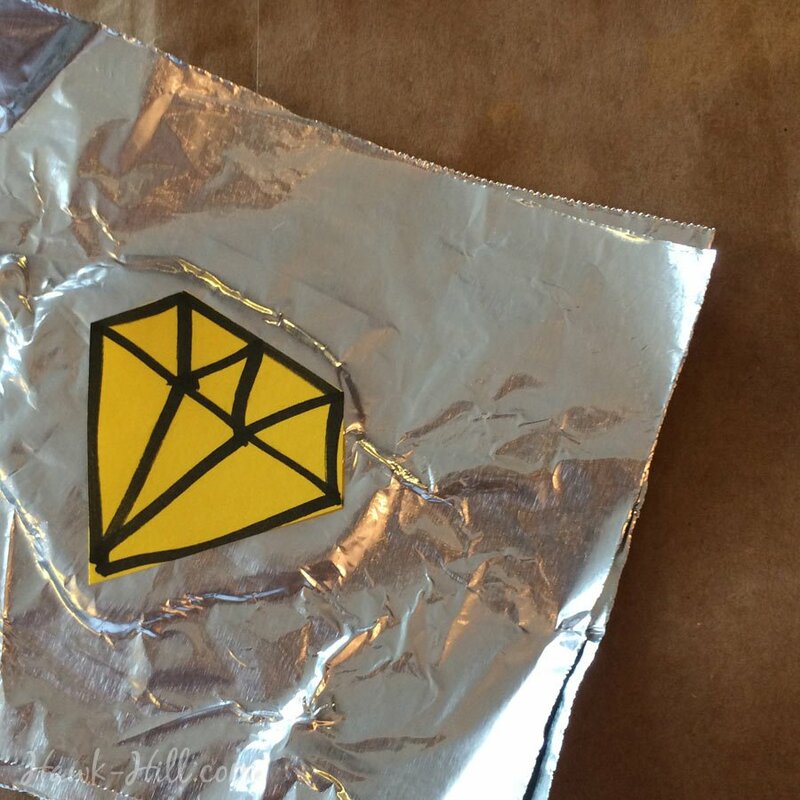 Lay your pattern on top of the “foil sandwich” and trace your design onto the middle of the material. This design can now be cut to any shape using regular scissors. 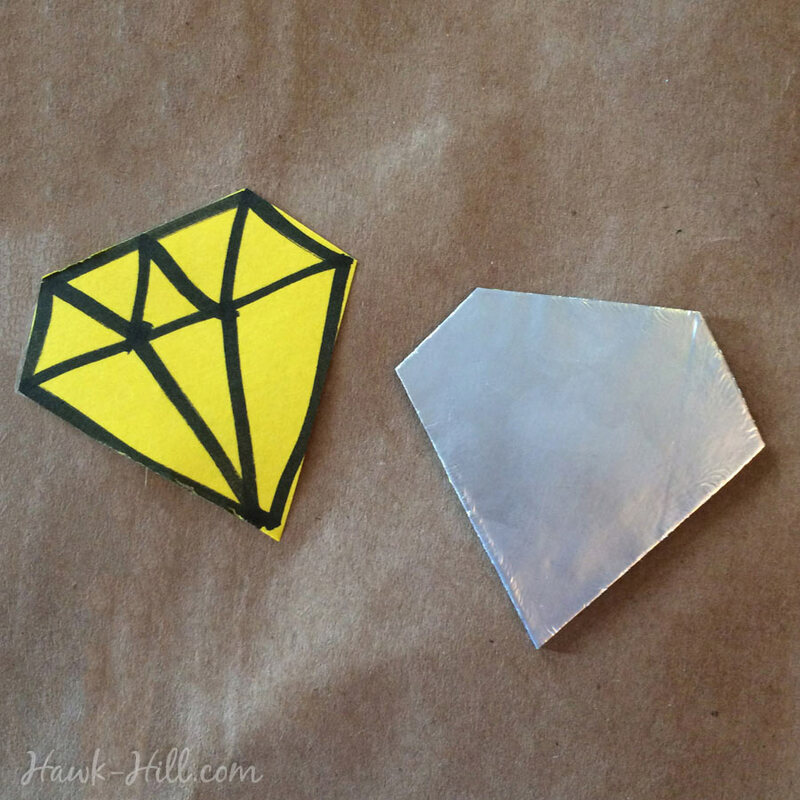 If you’d like to trace a design into the material, like I did with the shiny diamonds for my felt quiet book, just lay the cooled foil glue layers on a warm windowsill or warm kitchen for a few minutes, then carefully press the design into the top layer of foil using a blunt point (such as a dull pencil). You can attach the metallic material to the felt pages of a quiet book using hot glue, or any glue handy. I had great luck attaching with hot glue, but you’ll want to experiment with different glues and make sure any glue you do use can stand up to tugging and tension when fully cured.